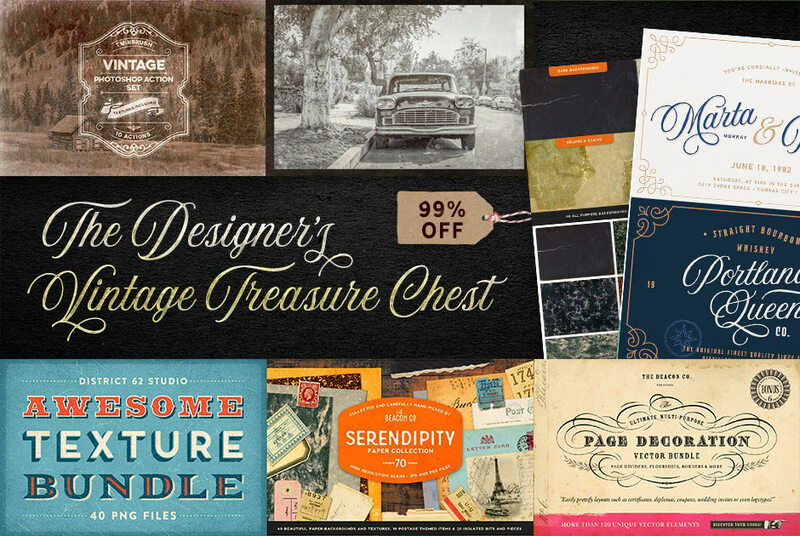 If you’re a fan of the vintage art style you’ll love digging through the wealth of quality design resources in this vintage themed treasure chest! This is one of the biggest ever vintage collections, bringing you 42 vintage fonts, rare vintage letterforms, textures, old papers, decorative elements, vintage brushes, old illustrations and handy vintage actions. It’s a true treasure trove for any vintage design lover. These tools regularly sell for $2663, but they’re now available for just $29 for a very limited time. That’s a 99% discount! This bundle allows the beauty, detail and authenticity of the past to flow into your design projects. Hundreds of hours have gone into creating these best-selling digital tools. Rare illustrations have been sourced, scanned and vectorised for your easy use. Centuries old vintage fonts have been refined and digitalised. Grungy markings and surfaces have been transformed into easy-to-use brush packs for your projects. Each pack in this collection is your chance to capture a moment from the past. Check out the full collection to see each individual product in detail, you’ll be amazed at the huge number of resources this bundle offers. The 99% discount provides a great opportunity to acquire some really rare and sought after items that you can benefit from in all your upcoming projects. Assets like fonts, textures and graphics form an integral part of a design, so it’s important to have the correct licensing for your tools. You’ll be glad to hear that every product in this bundle comes with a full extended license to give you the confidence to use your new tools in all your commercial projects.